Baptisms are celebrated on Saturdays at 9:30 am or Sundays at 11.30 am in the Church of Sts John & Paul, Willetton. There are no baptisms during Lent. 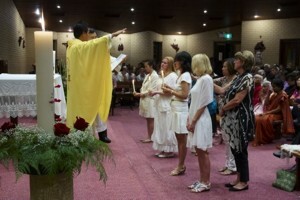 At the Easter Vigil, the RCIA Elect receive the Sacraments of Initiation. The request for an infant Baptism should be made at least three weeks before the date that the parents prefer. Contact is made in person or by phone at the Parish Centre. Particulars for the Parish register are recorded and an appointment made for the pre-Baptism preparation. The aim of the preparation is to discuss the implications for the child’s faith development in the request for Baptism and to be aware of the rites of the sacrament. In the case of the first child it is desirable that both parents be present for the preparation, and if possible, the godparents.